Anyone familiar with pre-release bits of iOS as well as the art of jailbreaking will no doubt be aware that as soon as Apple pushes out a beta version of their mobile operating system, the jailbreak community is usually on hand to implement some of its features into the current public release. This time yet again, it is proving no different, with one of the earliest examples coming in the form of the iOS 6 Photos Menu tweak that has recently landed in the Cydia store. The tweak itself doesn’t really bring a great deal of new features to those who use it, but it does hook into the native Photos app in order to change a few visuals. As you may have guessed from the name of the package, when installed, it brings a new and improved sharing menu to the Photos app. 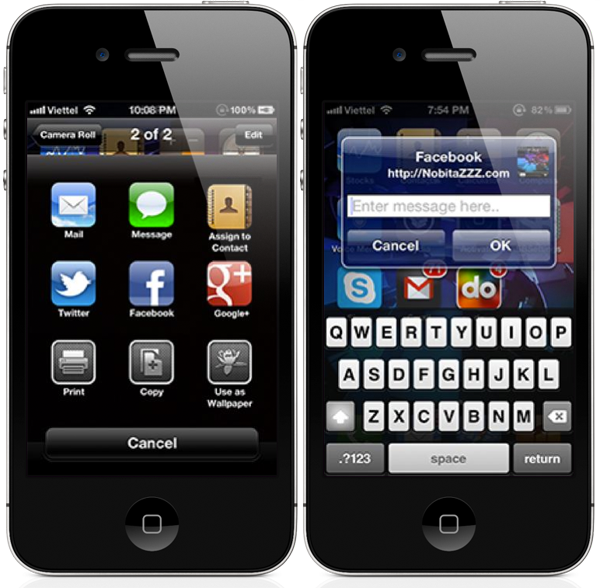 The menu that has been implemented is pulled directly from the same app which is in the first beta release of iOS 6 and brings a new visual implementation of the options available to the user. When a photograph is selected through the app and the additional action menu button is tapped, rather than displaying a list of options, the iOS 6 Photo Menu tweak now presents an icon-based action sheet to the user. The menu still contains everything users have come to expect from the Photos app, such as the ability to assign an image to a contact in the address book, as well as using it as a home screen or lock screen wallpaper. Additional options include the ability to attach the image to a text or mail message, as well as copying it to the clipboard and print using a wireless printer. Perhaps the two most appealing options to users will be the ability to share the photograph through the new menu to Twitter and Facebook. Apple have included Twitter sharing as a native option in the Photos app in iOS 5, however the developer’s choice to include a Facebook option has been pulled directly from the iOS 6 beta. When Apple officially launches iOS 6 at the end of this year; this tweak will be rendered useless, but until then it is a decent alternative to the iOS 5 Photos menu system. 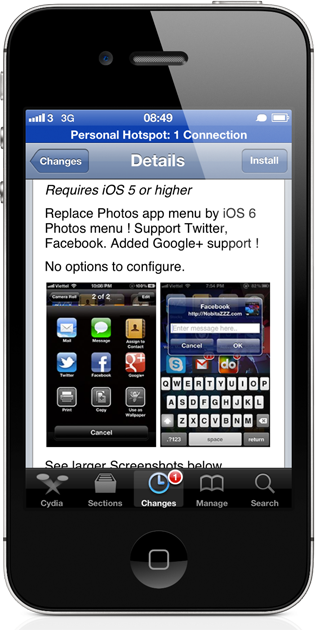 iOS 6 Photos Menu is available to download from the BigBoss repository as a free of charge download and requires iOS 5 or above.